Hi Everyone, Sundays are full of fun when I post two DT pieces for you. This is my second post for today - please scroll down for my other one. I used T!m's patchwork embossing folder with white card and then laid PPs in the sections to give this pastel quilted effect. Rub a dry cloth over the whole card to get rid of any excess. To get the glitter on use cut and dry foam, dipped into Art Institute glitter glue, and rub across the raised areas, sprinkling glamour dust on before it dries. Lay a piece of clean paper over the top and brayer across it to get the glue to adhere more strongly. To complete the card, add some shabby ribbon tied into a bow and a sentiment. I painted a chipboard frame with white acrylic paint and again sprinkled glamour dust over it. When it was dry I sprayed with a gloss sealer. Please come over to the challenge blog to see all the other wonderful inspiration that the design team have made for you and if you take part this week you will be entering for a chance to win some PPs and tools for you to try out or add to your collection. If you go over to Your Creativity Store you will find all of the colours and tools that are available to buy and at really good prices. As you can see PanPastels are so versatile and can be used with all your other art and craft supplies. Next week I will be using PPs to edge a card which makes several pieces of DP come together and look as though they all belong together. Thanks for stopping by today and thank you if you leave me a comment, I so appreciate it. wowie this is really beautiful, lovely colours! Love what you've done with this embossed background, looks really fabulous. Gee Brenda, this is really pretty ~ with the colours and the glitz that is. You are really showing your feminine side with this beautiful card. It really is beautiful. 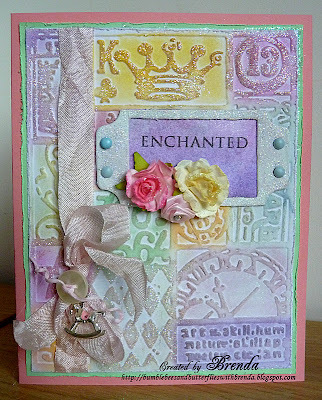 Brenda,this is just stunning such pretty colours, a fantastic use of an embossing folder. So pretty...love the pastel colors, and the added glitter...going to give it a try as you instructions are super!! Really beautiful and glittery Brenda and thanks for sharing the how to. Hopefully I will get time to enter this challenge cos every time I plan on it life gets in the way! 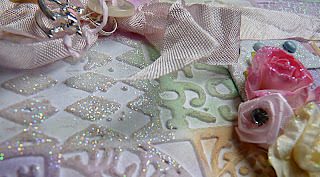 Fabulous soft colours Brenda - love the patchwork embossing folder and your glittering technique. This is sooooooo pretty. Methinks I must click on that link for Your Creativity Store!! Thanks for visiting dear Brenda! We are fairly well thank you. I see you are having a great giveaway. I won't enter as I don't do stamping any more but you certainly have some lovely prizes. Good luck to all those who enter! I am always slightly gobsmacked when I see all your wonderful work Brenda. Wow! This is gorgeous. 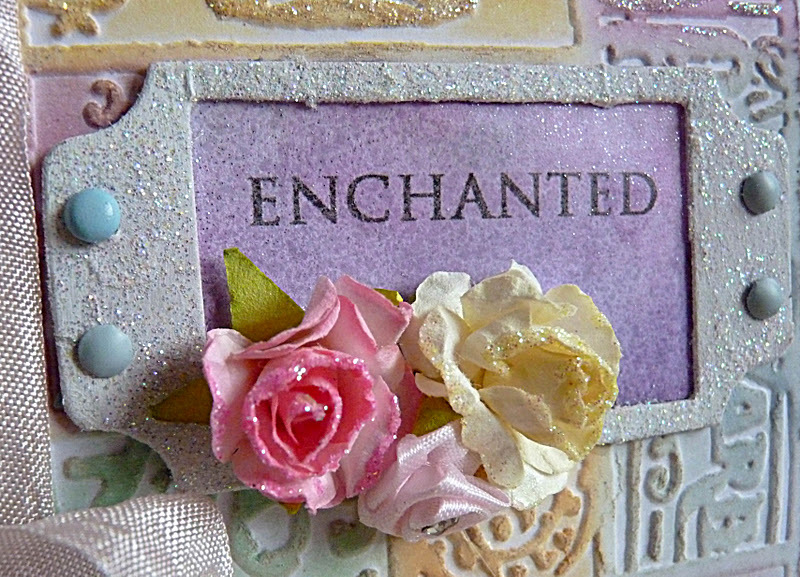 I love the colors and the textures when you embossed the embossed. this card is absoloutly lovely Brenda! It must have taken ages to make this, a lot of work looks like it was put in! Ooooh, ahhhh...I like that! Pretty, pretty! Tis embossed background looks amazing, Love it! Oh wow. Love this card! I love all the elements you used to put it together!! Oh, this is truly gorgeous!! I love glitter! Wow Brenda this is just sooooo gorgeous I think it's possibly my favourite of all your work! I love love love the pastel colours with the vintage look - amazing Mrs! Gorgeous work BRenda, I love the pastel colour palette and the glamour dust looks wonderful. WOW, this is simply gorgeous!!! Oh my Brenda this is so delicious! Love the pastel colors and sparkley bits. Gorgeous creation my dear. So very lovely, the pastels are so pretty. I must remember to play with this embossing folder more! Oh this is so beautiful Brenda, pretty colours. 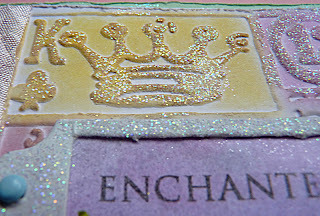 Ohhh, I love this embossing folder and how you emphasized it all with lots of glitter. Beautiful. Thanks for joining us at blogger's challenge this week. Haven't seen this embossing folder before and I love what you have done with is -so pretty. Such Beautiful colours Brenda love this embossing folder detail is just gorgeous another fabulous make chum. Hi Brenda! 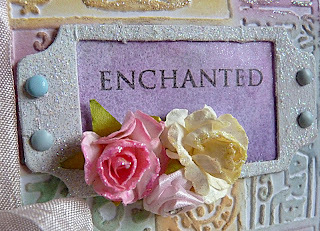 Your card is lovely:) Fantastic effect with the embossing, and the colours are wonderful. Thank you for joining Deep Ocean Challenge blog. Beautiful! 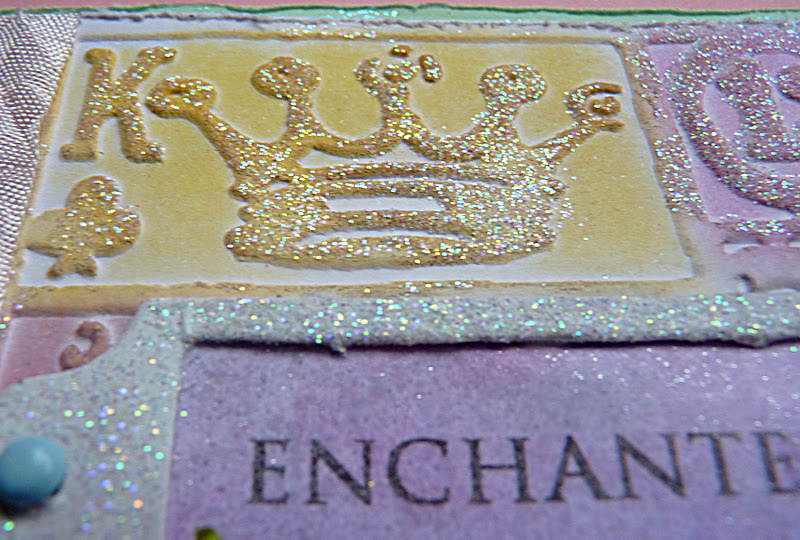 Love the shimmer of the Pan Pastels on the embossed area! Thanks for playing along with the Bloggers Challenge!